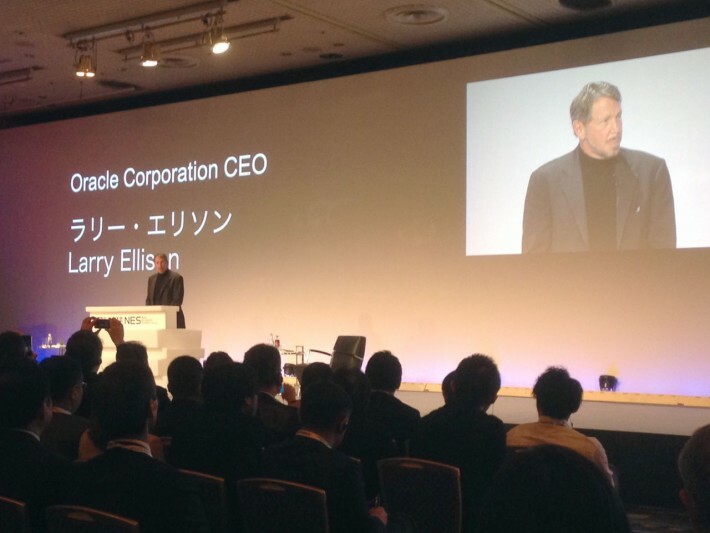 You are here: Home / News + Blog / Why did Larry Ellison, Jerry Yang, and the founders of Pinterest, Yelp, Fitbit, and Opower all take the stage at a hotel in Tokyo this week? Japan’s business community is changing, and Rakuten CEO Hiroshi Mikitani is leading the charge. 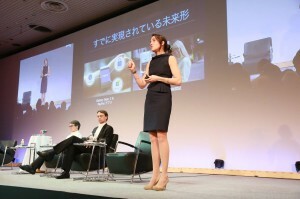 The Japan Association of New Economy (JANE) is Mikitani’s brainchild and an industry interest group for Japanese Internet and industrial innovators. 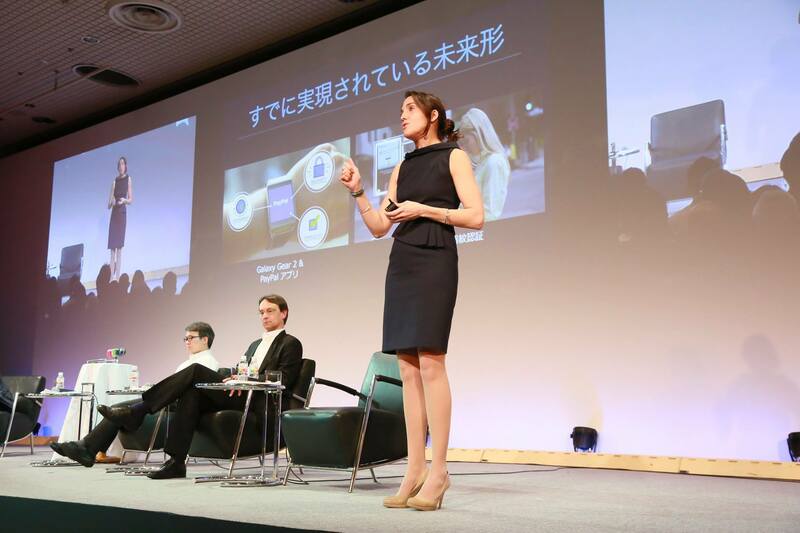 JANE hosted the New Economy Summit 2014 on Wednesday and Thursday this week at the Hotel New Otani in Tokyo. The speakers included Larry Ellison, Jerry Yang, Tony Fernandes (the CEO of AirAsia) and over 40 other business luminaries such as the founders or CEOs of Opower, Pinterest, Yelp, Renren, KKBox, Udemy, Viber, Fitbit, Rovio, Kakao, LINE, GREE, and many other hugely successful and innovative companies. Ambassador Caroline Kennedy made an appearance, and Prime Minister Shinzo Abe was one of several people who delivered opening remarks to a packed audience of at least 1,500 people. In addition to entrepreneurs, the audience included a large number of executives from Japanese companies large and small at all levels of seniority. This, in short, was the real deal. The big takeaways from the New Economy Summit represent the Japanese business community’s efforts to improve itself. What’s particularly exciting about the New Economy Summit is that it represents an agitation for change from within the Japanese business community itself. 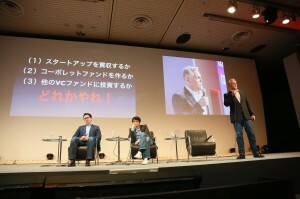 The key messages of the conference originated from a variety of professionals, both Japanese and foreign, who were handpicked by the Japanese conference organizers for their unique perspectives and valuable experience. In other words, the big takeaways from the conference, many of which contrast sharply with the ostensibly “traditional” way of doing business in Japan, represent the Japanese business community’s efforts to improve itself. So what exactly were those takeaway messages? Below are the three most salient themes that surfaced throughout the conference. Takeaway #1: Innovation thrives in a flat culture that fosters the free exchange of ideas. Various speakers emphasized the importance of intellectual fluidity and freedom throughout the conference. Tony Fernandes, the CEO of AirAsia, speaking at the New Economy Summit. In the first session, Larry Ellison discussed the importance for businesspeople of maintaining adaptability and an open mind. He described Oracle’s commitment, when purchasing a company, to look at each piece of the acquired company’s technology and evaluate whether it represents a superior solution to a given problem over Oracle’s own technology. Even when it requires an enormous investment of resources, Oracle will replace its own solutions with those it believes to be superior and thus maximize the competitiveness of its products over time. By insisting that they themselves don’t have all the best answers, Oracle has been able to realize several fabulously successful M&A transactions. 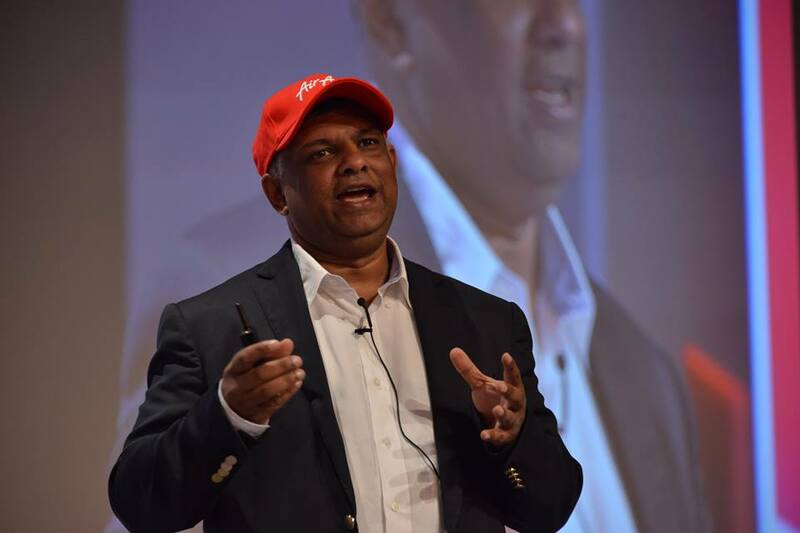 Tony Fernandes described how he flattened out the management structure at AirAsia, encouraged people from different divisions to socialize, increased occupational flexibility among personnel, and made himself available to all his employees. By working as a baggage loader or at the check-in counter himself every few months, Tony has been able to get a much clearer understanding of the challenges his employees face and can better work to address those challenges as CEO. He repeatedly emphasized that breaking down the hierarchy and rigidity of AirAsia was crucial to his success in revitalizing the company. Akira Morikawa, the CEO of Japan’s LINE Corporation, analogized successful startup culture to that of a soccer team, where personnel are expected to change their roles and responsibilities quickly to adapt to new challenges, just as soccer players adapt flexibly to the changing situation on the field. Jerry Yang voiced his agreement with this analogy. Echoing Tony, Matt Wilsey, the co-founder of Zazzle.com and now a technology investor, emphasized the necessity of breaking down the silos that develop as an organization grows to foster cross-pollination and communication among different divisions. This is one of the messages that hundreds of Japanese executives received: abolish your corporate hierarchy, increase the fluidity of your employees’ responsibilities, and encourage free debate within your organization. David Heller, the Managing Partner of Vertex Venture Capital, an Israeli venture capital firm, described the culture of free thinking and free debate in Israel as a major asset for the country’s entrepreneurs. He emphasized that this open discussion leads to faster and better decision-making at the corporate level. This is one of the messages that hundreds of Japanese executives received: abolish your corporate hierarchy, increase the fluidity of your employees’ responsibilities, and encourage free debate within your organization. This is a trend that I’ve seen in many startup companies in Japan. No dress code, no individual offices, and a casual atmosphere are the norm here among startups just as they are in the U.S. Although many larger companies and certain cultural expectations still encourage a level of formality that hinders the free flow of controversial ideas within organizations, the new generation of Japanese companies is certainly pushing corporate culture towards more flexibility. Takeaway #2: The celebration of failure is critical to innovation. Unlike in the U.S., where the value of experience gained in a failed business venture may outweigh the failure itself and make a failed businessperson more competitive for future jobs, by and large the Japanese labor market still punishes failure viciously. Precious few major Japanese companies (Mikitani’s Rakuten being a notable exception) regularly take on mid-career employees with the intention of promoting them to executive management. The result is that from a career perspective Japanese entrepreneurs take on an even greater level of risk than their counterparts in the U.S.
Carey Kolaja, VP of Global Product at Paypal, describes the company’s recent innovation initiatives. In this context, vocal support for those who try but fail carries a special resonance for Japanese entrepreneurs. Many speakers emphasized that removing the stigma of failure is crucial for fostering business innovation. David Heller referenced one of his VC firm’s most outstanding success cases, in which his firm brought in a new CEO, whose previous venture had failed, to lead an early stage portfolio company. The CEO led the company to a 100-fold increase in value and then a successful M&A exit, making boatloads of money for his investors in the process. Ben Silbermann of Pinterest noted that before the runaway success of his current company he had tried four or five times to create an online product and each time had failed for a different reason. Through persistence and a constant focus on the product itself, he and his cofounders eventually landed on the right idea and launched Pinterest. Matt Wilsey emphasized the importance not only of persistence in the face of failure but of publicizing and discussing one’s failures with others. Celebrating failure both provides valuable real-world knowledge to other entrepreneurs and also helps foster a culture in which businesspeople see failure as an unfortunate but acceptable outcome that is sometimes a prelude to outstanding success. Celebrating failure both provides valuable real-world knowledge to other entrepreneurs and also helps foster a culture in which businesspeople see failure as an unfortunate but acceptable outcome that is sometimes a prelude to outstanding success. This is an area where Japan’s business culture will need to change significantly if the country is going to recapture its former role as a world leader in technology innovation. The scale of the career and earnings risk that entrepreneurs here take on to launch or work for a startup far exceeds what their counterparts face in the U.S. The ecosystem is developing incrementally, but more large corporations will have to change their hiring and promotion practices before many highly talented individuals are willing to take on the risk of starting a business. Takeaway #3: Innovation is driven by a sense of urgency. Huge companies with huge cash reserves still represent a large portion of the Japanese economy. In fact, the amount of cash held by Japanese companies is currently at a near-record ¥150 trillion (roughly $1.5 trillion). It’s clear that many companies here still don’t feel a sense of urgency with respect to their use of capital. Speaking in Japanese, George Kellerman of 500 Startups exhorts Japanese companies to invest in ventures. George Kellerman, a managing partner of 500 Startups and until recently a longtime Japan resident, made an impassioned argument in Japanese for Japanese companies to invest some of this cash in startups or venture funds, or to start their own venture funds. He analogized this massive sum of cash to buried gold that is not being put to any appreciable use. Carey Kolaja, Vice President of Global Product at Paypal, described how dominating the online payment space had allowed Paypal to grow complacent until the recent emergence of competitors such as Stripe and Square. Carey emphasized just how much urgency has increased their creative output: now facing fierce competition, Paypal increased their four new product launches during 2012 to over 50 new product launches in 2013. Akio Tanaka, co-founder and managing partner of Infinity Venture Partners, also addressed this issue in the context of large Japanese corporations. He stated that because conservative management pushes many large corporations into a slow, almost comfortable decline, many companies don’t feel sufficient urgency to pursue groundbreaking innovation until it’s already too late. With $1.5 trillion in cash reserves, allocating even a tiny percentage of cash on hand to venture funding could trigger a enormous increase in the global competitiveness of Japan’s technology companies. One piece of good news for the Japanese business community is that many companies do feel a sense of urgency and have acted accordingly. Some examples that come to mind are Suntory’s recent acquisition of Jim Beam, just one of Suntory’s many recent (and generally successful) efforts at overseas expansion, or Rakuten’s and Fast Retailing’s moves to make English their official corporate language. Another encouraging reality is that with $1.5 trillion in cash reserves, large Japanese corporations allocating even a tiny percentage of cash on hand to venture funding could trigger a enormous increase in the global competitiveness of Japan’s technology businesses. The million-dollar question is when, if ever, these corporate giants will feel such a sense of urgency that they decide to make a significant push into venture capital. The message from the New Economy Summit was loud and clear: the time is now. As an American working with Japanese technology companies, there was one overriding message that impressed me throughout the two-day conference: the push for reform and innovation is real and is coming from within the Japanese business community itself. At the New Economy Summit I met senior executives from large corporations, investment bankers, and CEOs of over a dozen companies ranging from one-person shops to a rapidly expanding 200-person business. All these people were committed to revitalizing Japan’s economy and in many cases were already taking concrete action to that end. There was one overriding message that impressed me throughout the two-day conference: the push for reform and innovation is real and is coming from within the Japanese business community itself. This is a particularly exciting time for foreign companies to get involved in Japan, and for Japanese companies to expand overseas, because the nascent startup ecosystem here rapidly is expanding with support from major players in both business and government. Some enormously promising companies remain virtually unknown outside of Japan, presenting huge opportunities for foreign investors and business collaborators. As for when foreign companies should take the initiative and start exploring opportunities with Japanese businesses, the answer is crystal clear: the time is now.